Salt Lake Community College student Kelly Gunther will be competing in the Women’s 1,000-meter long track speedskating event Thursday during NBC’s coverage of the 2014 Winter Olympics in Sochi, Russia. Kelly Gunther will be competing in the Women’s 1,000-meter long track event Thursday during NBC’s coverage of the 2014 Winter Olympics in Sochi, Russia. Being put on the 2010 Olympic team and then being taken off, and then shattering my ankle during a speedskating race have been challenges I have had to overcome. 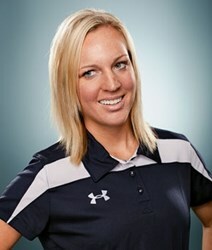 Kelly Gunther made the 2010 Olympic long track speedskating team, and then she was bumped after an athlete was allowed a re-skate, barely edging out the Salt Lake Community College student whose plans these days include pursuing a career in early childhood education. But this time, Gunther made the team, and she will be competing in the Women’s 1,000-meter long track event Thursday during NBC’s coverage of the 2014 Winter Olympics in Sochi, Russia. “Being put on the 2010 Olympic team and then being taken off, and then shattering my ankle during a speedskating race have been challenges I have had to overcome,” Gunther stated on the U.S. Speedskating web site. The Ohio native added injury to upset in 2010 when she fell during a race at the Utah Olympic Oval in Kearns and suffered a double-compound fracture of her ankle, nearly separating foot from leg. Gunther went through intense rehabilitation and made the 2011 World Cup team and has been getting stronger ever since. The girl who gave up the jumps, spins, dresses and makeup of figure skating so she could go faster now calls West Jordan home while attending classes at SLCC. Her many fans follow her on Facebook and Twitter. Thursday’s event will be Gunther’s only Olympic event. For those following SLCC student athlete Eddy “The Jet” Alvarez, they will have chances to catch him racing at short track speedskating also on Thursday, and then again in events on Feb. 15, 18 and 21. Kelly Gunther will be competing in the Women’s 1,000-meter long track event Thursday during NBC’s coverage of the 2014 Winter Olympics in Sochi, Russia. Kelly Gunther will be competing in the Women’s 1,000-meter long track event Thursday during NBC’s coverage of the 2014 Winter Olympics in Sochi, Russia.